Critics were thrown into momentary silence as Bindaree displayed a really stunning performance at Aintree; swiftly jumping out of an earlier lacklustre position, and assuming and maintaining an illustrious lead till he crossed the ultimate finishing line in the 2002 Grand National. Beating a would-be first-time winner – What’s Up Boys – the brave sprinter walloped an entire field of longstanding champs to come out as the fastest runner and overall hero of that amazing April weekend. Ingeniously piloted by Cheltenham’s universally recognized Jim Culloty, the award-winning creature astounded the unbelieving Liverpool crowds as he boldly careered his way into the final stretch, shaking off a string of unyielding competition from the 2nd-ranking contester – Richard Johnson. Well beyond any tinge of doubt, the unfaltering gelding seemed to have entered the ageless English battleground with a pre-calculated dashing blueprint that evidently took aback all closest challengers…as gradual expressions of stark amazement could be seen creeping on the completely surprised faces of many a watcher, while the tough-fighting Culloty continued to steadily wear down all leading racers to a one-and-three-quarter winning distance. The epoch-making showdown’s third place went to the enduring sprinting icon Tony McCoy; a seemingly luck-eluded equine-sporting maverick whom top honours had appeared serially dodge over the preceding decades. The tellingly title-hungry McCoy hadn’t recently won and wasn’t going to win top-slot National honours in that Culloty-dominated National edition. And all these little disappointments befell the admittedly finessed rider due to no discernible faults of his own. Fate alone might have tilted odds against him – for he’d previously had an especially successful gaming record – frequently dotted by a superfluity of bold manoeuvres…indeed uncommon racetrack firsts, not only in modestly great Grand National performances but also in a string of several other lower-ranking gaming derbies, in England and Ireland and far-flung foreign racing turfs. The frequent pundits-tipped riding star had actually been tipped to dominate the day’s packed field a few months earlier, but then a huge deal of this massive optimism dwindled distinctly toward the eventual year-after-year clash. A sizable number of McCoy’s diehard fans began to sense that the renowned ace was beginning to somehow give in to either fatigue or some kind of public pressure…and we all appreciate that sort of unexplained ‘block’ that curtails a natural giant’s best. Perhaps to observe a healthy break from the preceding tales of the palpable racetrack heat that characterized the extraordinary international event, the 2002 annual edition run as the 154th Martell Grand National. This unique formal reference was long adopted as a way of according lasting corporate honours to the fortunate benefactors under whose mainstream funding the year’s showdown takes place. 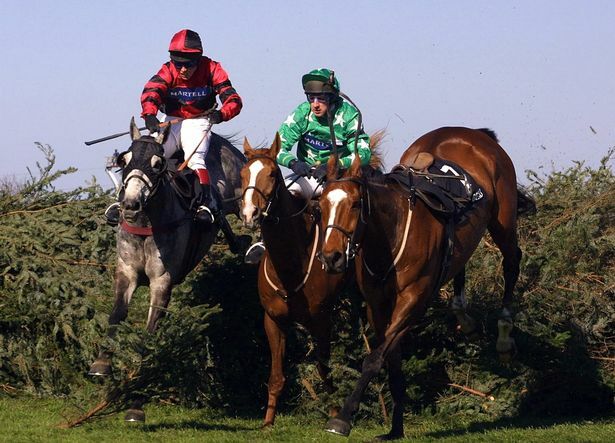 And, as has been the changeless custom, the significant steeplechase was staged at the predictable Aintree Racecourse within Liverpool’s calm spring environs, on 6 April 2002. The 8-year-old Bindaree was owned by the Irish man of modest equestrian rearing ambitions known as Raymond Mould. Furthermore, the lucky 20-1 shot had been trained by Nigel Twiston-Davies in Naunton; at the not-very-well-known Grange Hill Farm, situated some snugly miles deeper within Gloucestershire’s innermost neighbourhoods. Elsewhere, the breeder of the colourful occasion’s most impressive horse was one virtually unknown Noel King – another Northern Ireland’s man of fine equine-handling talents…whom cheerful Providence chose to bless with some token of worldwide recognition, almost as if to grant the middling breeder at least a worthy modicum of fame to motivate him into pursuing greater glories of a similar kind in later horseracing waterloos. As is the continuing norm, the year’s contest featured the regular field of 40 runners. Despite the considerable number of formally cleared contestants, only a paltry 11 of these completed the traditional Aintree circuit – the rest fizzling out after meeting unforeseen misadventures or such other immobilizing mishaps. In the end, the initially modest field ultimately fell off to about ten patently persistent horsemen, all perspiring rather defiantly atop their likewise tenacious mounts. In the course of the intense chase, some 9 horses succumbed to immobilizing accidents within the first fence. Also, two deaths occurred as the remaining 29 horses tackled the rest of the treacherously winding circuit – The Last Fling (2nd Canal Turn) and Manx Magic (20th fence). The monumental tussle was captured live on BBC One and on their rival media station ITV1. The latter was however badly beaten by their longstanding nemesis in terms of locally and globally estimated viewership numbers – 8.6 million against 300,000 watchers! Unlike many other past National versions, whereby an obviously well-known face would emerge out of the crowds to acknowledge public kudos and give the habitual press remarks, things proved strangely different that time around. To be more specific, there was a stark uniqueness seeing visibly agitated sports newspaper writers and camera-toting scribes meet an obscure fellow coyly coming out of the main house at the practically shadowy Grange Hill Farm… an unfamiliar gentleman of a confident, unassuming composure who shortly said he was Nigel Twiston-Davies – the proud horse-breeding fan who had for many patient years diligently trained the just-crowned Martell Grand National conqueror - Bindaree! The publicity-shy instant hero confided that Grange Hill’s eternally horse-loving community hadn’t been minting any really juicy fiscal returns previously. He nevertheless admitted that the little establishment would no doubt look finer, now that one of their superb products had brought the small harem immense glory about an hour before. It was also an essentially rapturous moment for Bindaree’s happy owner, Raymond Mould. Reminiscing over his sorrowful parting with his late wife (Jenny) two years earlier – who had succumbed to cancer back in 2000 - the wryly smiling horseman lacked much to say. He, however, didn’t fail to promote the larger game-loving world many other bigger racecourse milestones in future equestrian steeplechases, away and at home.